My wife’s laptop recently died and was replaced. Unlike last time, there were regular backups with the last performed only a day or two before the failure. So all is fine… Right? Turns out not so much. The new laptop runs Windows 8.1. I plugged in the backup drive and opened the settings to look for the Backup and Restore link… and nothing. File History sounded promising, but different. It turns out Windows 8 introduced a Time Machine like backup tool so they phased out the old Window 7 style backup. An option was provided in Windows 8 to restore “old” Windows 7 backups, but that was removed in Windows 8.1. That means people had a one year window to update from Windows 7 to Windows 8 and restore their files before Windows 8.1 was released. Not helpful! It is almost as if I should have never used the Windows 7 backup feature at all and just copied the files onto the backup drive… Now I have to decide how long the File History tool in Windows 8 will be supported or if I need to find another backup solution. Another years has past, so once again it is time for me to provide my (not very) insightful opinions of the anime that finished their run in 2013. As in previous years, I give my opinion without providing an actual review. This years installment is longer than usual because I got myself a Nexus 7 to use on my train ride to work. I also tend to focus on the short series more because there is less risk with the time investment, so that also bumps the number in the list. And, lets begin! This was a hotly contested position in that there were several other series I could have equally put in this position. * This series won due to having a very strong and unique storyline that takes risks that many anime will not. From early on you are given the sense of something not quite right underlying the otherwise peaceful world. It is that question that keeps you going during the slower paced episodes that provide the needed background information early in the series. And don’t judge it too early, because there are time skips taking the main characters into adulthood. I think this series could have been improved by not being 25 episodes long. Not because there was filler added to stretch it out that long, but because it fitted exactly 25 episodes and breaks between episodes seemed out of place. I think I would have enjoyed this even more if I had watched all episodes one after the other, or had this been a series of five movies instead. * The other very strong contenders were Attack on Titan, Psycho-Pass and The Eccentric Family. I’m sure many people consider this the anime of the year. It does have a very interesting story, with the titans remaining imposing throughout. I also found the animation in the plentiful action sequences to really highlight the “3D maneuver gear”. But I disliked the protagonist and his over-emoting so much that at one point of the anime I was thinking that if he died right now it would great and we could get on with the real story. I continuously had the impression that this was anime that started with a bang was going to fade away, but there was always something that save it. This was my bit of crazy for the year and I was entertained by all the pretty colours moving around… It is a bit all over the place, which is made even more difficult when there are sets of characters with the same name across different time points. The episode #0 for this series did not help. It is basically an episode from one of the previous incarnations of this story and contained a lot of information with little context. But don’t worry, there is also an additional episode at the end to explain things for you. This was my Anime of the Year in an early draft of this post, mainly because I had not seen a serious dark science fiction anime in a while. And it definitely had some darkness to it – the episodic first half of the series showed some brutal crimes coming from the criminals deranged point of view. On top of the gore in the committed crimes, the implosion/explosion of the criminals was a highlight (in an “I am not a psychopath” kind of way…). The series avoid greatness mainly by having an overly formulaic character set and probably needing to be a few episodes shorter as there were a couple of nothing episodes. Not a series I thought I would like from face value, but I saw a few positive reviews and noted who the author was and decided to try it. Very good decision! There is nothing individually outstanding about it, yet it remains consistently solid throughout. Despite my concerns, the comedy aspect did not go overboard. This is one of those series where you will sit down to start it and all of a sudden have finished watching all the episodes but you will have no real idea why. The follow-up movie to what I considered to be the series of the year in 2011. Part of what I liked about the series was having no idea what was going on, but knowing that I wanted to. This was not captured by the movie – not surprising given it was a sequel – but it was a decent follow-up to a great series. For a 13 episode anime, this show managed to provide a fairly complete mythology without any episodes whose sole purpose was to explain it. Instead the episodes gradually reveal the world and you are required to piece it together bit by bit. This does lead to a reasonably slow build up and also leaves gaps in our understanding of the world, but I often find that much more enjoyable than shows that rush to tie up every loose end. This is really a 2012 anime, but it was released onto DVD in 2013 so it still counts… My blog, my rules! Creates a modern day folktale and focuses purely on how the situation is dealt with by the people involved. Charming in its simplicity. I really liked the original Railgun, but this was just more of the same. In fact, it really was more of the same – the first half was a retelling of what we saw in A Certain Magical Index from a different perspective. It would now take a very good story line to get me to watch any more of this franchise. Follows politics, economics, religion, technology and war and shows how they interact reminding me of a less interesting version of Spice and Wolf. While it is generally fairly seriousness, it switches to the outrageous at the blink of an eye. The setup is very weak, but it all fits together if we assume the Hero trusts the anyone with exceeding large breasts (even by anime standards). A show that was bad while being good. It managed to combine a vast variety of anime clichés in a single series in a way that was at least interesting. This show started out being quite enjoyable. Once most of the mystery disappeared around half way, pseudo-intelligent conversations became the method for moving the plot along. Quoting Shakespeare everywhere just adds to the pretentiousness. A series being 10 episodes long is really quite strange, so you would think they had a solid story line planned… But I see not much planning of anything beyond the first episode. The lack of story was hidden by introducing a couple of new characters every episode. Yet the series was somehow not that bad. Welcome to a mecha anime that spends most of its time not being mecha. The whole middle section of this anime is completely unnecessary, managing a beach episode and one revolving around belly dancing. However, the underlying elements of the story were interesting enough. It is a pity they were used so poorly. This series was so laid back it did not even have a plot, which is what I think made it strangely likable. The title character was definitely the strongest and frequently stole the show despite not being the main focus. “Gritty reboot” more closely following the original games. The focus is only on the major aspects of those games at the expense of story telling. Fine, there are four episodes so you can not do too much. But it was disappointing when I realized that this was really an advertisement for Pokemon X and Y.
I chose to watch this because all the characters were adults. It turns out adults taking care of business is not what I would consider great entertainment, but it was oddly refreshing and there was nothing I found too bad about it either. Builds a unique world and deals with an interesting situation, but this is almost all that the series has going for it. The lead character is the demise of the series. This series is probably the best of the rest. I just could not justify it being in the “Recommended” section, but it seemed better than “Average”. Some of the comedy becomes tired near the end of the series, which further dragged down a fairly weak finish. I was impressed that this series managed to get a “beach” episode without technically having one. Another movie that saw theatrical release in 2012 but out on DVD in 2013. I was a bit disappointed in this given its series was one of my favourite animes of 2011. Not because the movie ruined it, but because the first half was essentially the first part of the anime retold. The second half was great! Hopefully the next movie will make it up to me. This series promised much in the first episode and rapidly proceeded to ignore that any such promises were ever made. It is one of the most spectacular crashes I have ever seen a series take. Do you know what a fantasy world full of magic and the traditional fantasy races needs introduced from Japan? Otaku culture. That’s right… Well, I suppose that is one way to try making your audience feel like they are important. Too much self-serving “isn’t anime great” for my liking, even if it was attempted humour. This actually has all the potential to be very good. The story builds and builds… to nothing. I feel like I missed the final few episodes, but I am not drawn in enough to check if there is an OVA or movie to follow. The highlight of this movie was the animation of rain drops falling in the pond during the opening scenes. The word “unlimited” is what is wrong with this anime. It means there is never any risk that the protagonist is going to be harmed in any way. Imagine, someone saying “this battle is really difficult given I am committing about 1% of my strength to it – I’m in real danger here”. Bah. I figure I should not include this in the Sub-Par section as I did not complete watching it and it may have improved substantially. What was quite “novel” about this series was the use of rotoscoping, although it does lose a lot of detail from people even at a short distance from the camera. A bit disappointing given the background art was very well done. I persevered as long as possible watching this telling myself “I have never dropped an anime, it is only 13 episodes, I’m sure I can make it…”. I gave up part way into episode five, read a review saying there was a big reveal a few episodes on, skimmed through to that episode, decided there was no hope and stopped. This missed making it into my 2012 list, because the final episode was released at the very end of the year. Not that speed was essential here given the first episode was released in 2006. The time taken – and I suppose budget – is clearly shown with great animation, particularly in fight scenes. I think it would be a better series as just a dark horror vampire versus Nazi versus Englishmen story without the humour parts. This did not make my list this year or last year because it had not finished yet. It looks like it is taking a break after episode 99 for a while. I would have said much better things about this series at the end of 2012. Currently I say it is still worth watching the ~100 episodes that have been released, but it can be slow going and a bit predictable at times and the recap at the start of the episode has become too long. Despite that, it is still an anime I watch immediately on release. It is also my constant reminder to find out how many episode a series has before starting to watch it. And that is the end for 2013. Anything good I missed? Well… I intended to be more organized and get these posted on time each month. Maybe next year. 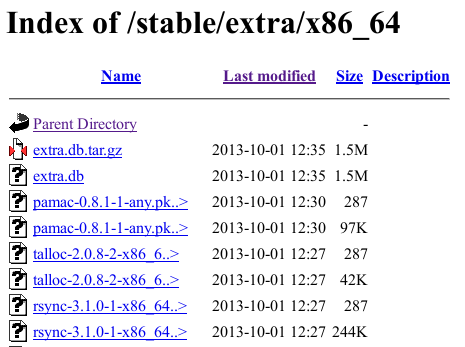 A lot of security bugs were found in Xorg, including one from 1991! Looking to cairo for a standard c++ 2d API, why it is bad, and why we should ignore that last link! The Debian init system vote started, came to no conclusion, then was summarized. And apparently glibc is good code! I was having a look at the current state of the Arch Linux repositories today in terms of the number of packages each person maintains and thought it interesting to see who did the packaging last year. So here are some numbers! First, the two most prolific committers are Andrea Scarpino and Sven-Hendrik Haase. They both package KDE, which is in itself a lot of packages, but they get bonus commits for the [kde-unstable] repository where a lot of beta and release candidates are packaged. There is a lot of scripting going on for those rebuilds too, so don’t give them too much credit! Sven also deals with boost lately and the required rebuilds. In places 3 and 6 are Jan Steffens and Jan de Groot who do our GNOME packaging. Rounding out the major desktop packagers is Evangelos Foutras in 9th place. In 4th, we have Andreas Radke who packages Xorg among other things including LibreOffice. Eric Bélanger takes 5th place. I think he needs a specific shout out here because of all the effort he puts into maintaining the packages that officially have no maintainer. He regularly updates these packages and fixes their bugs. He also does far more than his share during rebuilds. I am in 7th. This appears due to rebuilds for the removal /sbin et al., and the static libraries removal I pushed this year. In 8th is Tobias Powalowski who maintains the kernel package and deals with most of the module rebuilds. Now a quick look at TU controlled repository commits. This includes the [community] and [multilib] repositories. Not surprisingly, in first place we have Sergej Pupykin. He maintains about a 1/3 of the packages in the [community], although only has 1/6 of the commits… In 2nd place is Alexander Rødseth, who as far as I can tell does not maintain any specific package groups, so is just working hard! Bartłomiej Piotrowski is in 3rd (and who also rounded out the top 10 for the main repos) and we see Sven-Hendrik Haase again in 4th. I’d also like to note the importance of all (or at least some!) of the people who have relatively few commits. In fact, I think we need more of them. I’d like to see the [extra] repo be almost exclusively the big package groups (Xorg, KDE, GNOME, XFCE, perl, python, etc) and [community] be all the additional packages with many more packagers each being responsible for a handful of packages that they are really interested in. So if you are thinking of applying for a Trusted User position, look at the tail of the distribution and do not let the big packagers put you off. Joint post as I never got around to doing November’s one… That just means lots of links for you all this time! 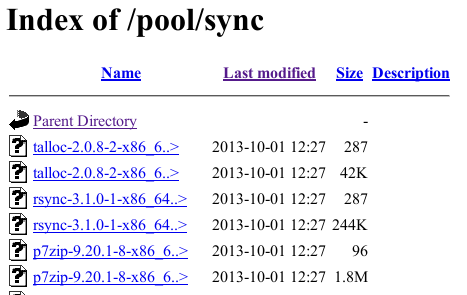 Interesting post that details how Gentoo is organized. Can C++ error messages get even longer? The trailer for Kung Fury is so good that the first stage of their Kickstarter is funded! And finally, a skill everyone should have… How to break an apple in half with your bare hands! A bit late this month… Tough! Work has started on an embedded JIT for GCC , and some python bindings appeared. Google is offering rewards for security issue in a range of core free software. The 3.0 linux kernel has had 100 patches released! Surely automatic wordpress updates can only end in disaster! Whoever was in charge of the Fitocracy update is going to be in trouble. An update a 6am on a Saturday going bad… Who would have guessed! More follow-up from the afore mentioned Frostcast featuring Manjaro developer Philip Müller. Just past the 16 minute mark. We learn and everyone makes mistakes. And the new server change every package is new synced from Arch Linux so there is no security issues. … We sync daily so if there is any problems with our system it’s ninety percent from Arch itself, so I don’t know why they bash us. I am not going to claim Arch is the bastion of all things security – in fact I know Arch is far from perfect here – but Manjaro claiming that they are on par with Arch is wrong. Saying “we sync daily” is frankly deceptive. The daily syncs are to the Manjaro unstable branch, so packages can take a while to reach the stable branch where the vast majority of users get the package. As I have pointed out previously, Arch does not separate out security updates from plain upstream updates, so when Manjaro holds back updates on the unstable branch in the name of stability, they are also holding back security fixes. The updates need monitored for security fixes and either 1) pushed more quickly to the users, or 2) have the fixes backported to the “stable” packages. In summary, the indiscriminate holding back of all updates in the name of testing(?) is why I “bash” Manjaro security. With this system, Manjaro is always running behind Arch, so claiming the Manjaro security issues are “ninety percent from Arch itself” is full of… optimism. And before the “leave Manjaro alone” comments, I will stop posting about it when I have no need to correct such false statements. Quickoffice is free for all! Will openSUSE use BTRFS by default?